"The best ingredients make the best burger. 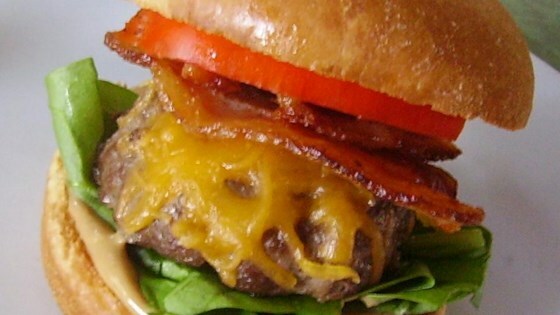 These ground sirloin burgers are topped with applewood-smoked bacon, peanut butter, and sharp Cheddar cheese, making them the best burgers around!" Mix ground beef, black pepper, onion powder, garlic powder, salt, Worcestershire sauce, and cayenne pepper in a large bowl until evenly blended. Form beef mixture into 6 4-inch wide patties. Transfer patties to a large plate and cover with plastic wrap. Refrigerate until patties are slightly firm, about 30 minutes. Cook beef patties on preheated grill until they are beginning to firm and are hot and slightly pink in the center, about 4 minutes per side. An instant-read thermometer inserted into the center should read 140 degrees F (60 degrees C). Sprinkle Cheddar cheese over patties about a minute before they are done. Mix peanut butter and maple syrup in a microwave-safe bowl. Heat peanut butter mixture in the microwave until slightly runny, about 25 seconds. Stir again. Spread peanut butter mixture over hamburger buns and top with beef patties, lettuce, tomatoes, and bacon. What's cooking in Milwaukee? These cupcakes, also known as the Peanut Bomb! Maple syrup is added to Adams® peanut butter due to the brand's lack of sweetness. If you use another brand such as Jiffy, use less maple syrup and perform a taste test. Soo good...Didnt have Maple so use any jam, ect.. Super delicious!! Don't put too much Worcestershire into the meat mixture or it could become crumbly..
not sure if it was my husbands grilling or what but they were so dry.